There are choices for regulators, MNOs and consumers when it comes to deciding whether GSM or CDMA will prevail in Africa, but Nigeria is one market where the two competing technologies now appear to be involved in a fight to the death. 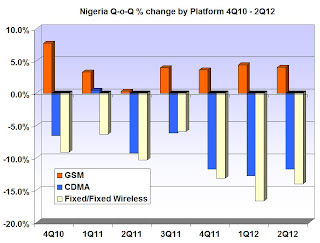 The telecoms sector had an active subscriber base of 103.4 million at the end of July 2012 the latest subscriber data from the NCC shows. The same data shows the GSM subscriber numbers rising quarter-on-quarter, whilst CDMA and the fixed wireless markets continue to decline. 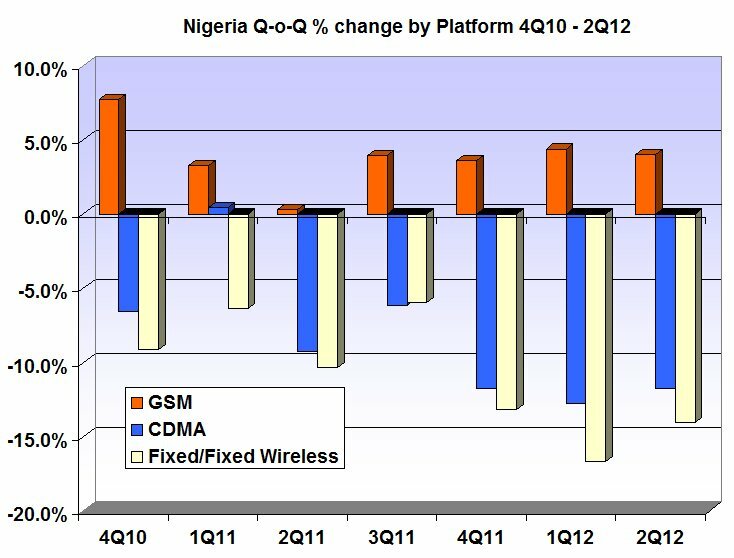 Historically, Africa has been – and still is – dominated by GSM technology. The reasons are simple: it was the first available option before NTT won ITU approval for the CDMA system and its simplicity suited conditions on the ground across the continent. The market in Africa is mostly voice and text with relatively low adoption of data services. Lastly, it follows the lead of Europe’s major MNOs who have strong ties with countries across the region. On the technology front, Africa can learn from overseas experiences and often leap-frog in progress, cutting out intermediate – and possibly expensive – steps in technology deployment. While it is a possibility that the consumer market in Africa will reach significant levels of demand for broadband data services by the time LTE and 4G have become the new normal, it has to be noted that there remains a need for 3G services right now, albeit in lower rates of adoption than seen in developed economies. And GSM is very well entrenched and the disadvantages it still has are less of an issue for African consumers and operators than for their European counterparts. Alongside that, there are some specific, regional issues that actually inhibit CDMA deployment. Certain transmission frequencies are commonly used for CDMA and, as a result, that equipment is less expensive. In many parts of Africa, those frequencies fall into reserved ranges (usually for TV services) and, although there are moves to reallocate spectrum, this is not an overnight process. Secondly, there are generally available skills for GSM across Africa, whereas CDMA skills are harder to find and more expensive. Inevitably, Nigeria is a benchmark for guessing what the future holds. In that country, there's eighteen times as many GSM users as CDMA ones, even though both systems were brought to market at about the same time. The key factors there are strong user demand for basic services and a preference for mobility, which the city-based CDMA networks cannot provide. Nevertheless, one lesson of history is that it is not wise to generalise about African markets. The conditions on the ground vary greatly, as do the preferences of the consumers. Even between apparently similar countries such as Ghana and Nigeria, there are major differences which result from both social and economic conditions. For more on the background to the African mobile sector and the dominance of GSM, claim your free download of The Africa Mobile Factbook 2012.